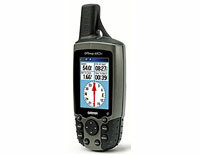 Garmin GPSMAP 60CSx (010-00422-01) €335.00 - buy online at mysatnav.ie - Ireland's leading GPS & Sat Nav store. The 60CSx is shipped with a 64MB microSD card that can be used to hold maps from optional MapSource� software available on DVD. In addition the GPS can also take preloaded microSD cards of both Garmin Bluechart� marine map data and Garmin City Navigator� street-level maps for Ireland, UK, Europe, North America etc. Currently there are neither topography maps or inland water way maps available from Garmin that cover Ireland. It is possible to download freeware contour maps of Ireland from the Scottish Mountaineering Club that by all accounts, while not of OSI standard, are still very good. If you decide to download these maps to you device, follow the SMC instructions carefully, as any mistakes or data corruption may affect the warranty of your GPS device. You download these contour maps to your GPS device at your own risk. This colour handheld GPS is at the top end of the range but it is a very popular and well designed system that has won a number of awards. With a high sensitivity SiRF GPS receiver, expandable memory, mapping capabilities, barometric altimeter and electronic compass this system will give years of enjoyment to hillwalking enthusiasts.